Since 2007, all smoking has been banned inside buildings in Hong Kong. Then the government took a more serious step and banned smoking in a lot of outside areas as well. So smokers gather around designated areas, mostly in back alleys, for a smoke break. Here we meet a eclectic crew of smokers, from a business executive, a pizza delivery man, to a sales girl. They meet, swap horror work stories, and bond over nicotine. There's a certain camaraderie that smokers have that I've never fully understood, being a non-smoker myself. I always remembered, when working food service, my coworkers looking forward to their breaks and never, ever going alone. LOVE IN A PUFF captures these relationships perfectly, and almost makes me a tad envious...almost. Jimmy, the sales executive, meets Cherie, the salesgirl, during these get togethers and a flirtatious relationship starts. Their relationship starts as sweet and playful as any budding romance. Text messages are traded; smoke breaks conveniently coincide; and they seem to hit it off quickly. An interesting aspect of the movie is that it takes place over one week, and the date pops up each day to remind us how many days this couple has been "talking". Randomly interjecting between our couples journey are documentary style interludes that interview people they have interacted with about the smoking ordinances or relationships. The movie doesn't gain much by adding these scenes except creating a tone for the smoking culture of Hong Kong. Through their conversations, we learn she's a older than him and seems bored with her life, from her job to her boyfriend of five years. So, the fact that this relationship goes so fast over such a short time is almost unbelievable. Jimmy's character isn't overtly artistic, free-spirited, or extraordinary; he's just a nice normal guy. You can see in Cherie's eyes from day one that she's intrigued with this guy and seems quick to jump into into something new and unknown. If the days weren't splashed across the screen, you could put your own time stamp on their relationship and some of the actions wouldn't seem so brash and unearned. However, since we're forced to accept how fast this is all happening, we thrust our own reasons for the character choices and left feeling uneasy about the eventual arc. The chemistry between the actors is natural and radiates off screen. Many of there exchanges must have come from real life examples because I found myself thinking, "I've said that!" or "That's totally what I would have done too!" 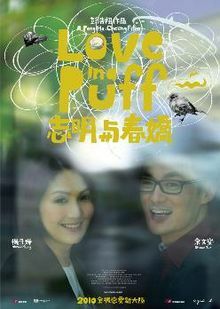 And despite some story flaws, LOVE IN A PUFF really is a relatable and charming movie.